The Yale Center for British Art in New Haven is hosting a stunning exhibit that includes decoupage, natural history specimans, embroidered textiles, sketches, garden design, and live floral displays. 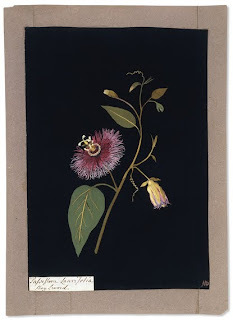 At the age of 72, Mrs. Mary Delany began working on a collection of botantical collages, or "paper mosaics," as she called them. She would create each work by cutting minute pieces of colored paper to represent each part of the particular specimen, then pasting them on a black background. In the next decade, she made nearly a thousand of these collages before her failing eyesight caused her to stop. The current exhibit showcases thirty of these collages, as well as other works by Mrs. Delaney and her contemporaries. The exhibit runs through January 3, 2010. Mrs. Delany and Her Circle, the exhibition catalogue published by the Yale University Press, is now available at the Hamden Library. We currently have a selection of botanical books on display that were inspired by this exhibit, including Maria Sibylla Merian & Daughters : Women of Art and Science by Ella Reitsma, Flora Mirabilis by Catherine Herbert Howell, and The Art of Botanical Illustration by Wilfred Blunt. Stop by our lobby to see the entire display!